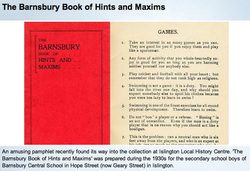 "The Barnsburian" school magazine had a career of highs and lows during its publication existence. Following is a selection of past issues in Adobe Acrobat PDF file format for you to access and enjoy. This website's editorial staff would appreciate receiving any other previous magazine editions not listed. They can be uploaded on the site for readers to appreciate the achievements and contributions of former pupils, school faculty and the school itself. 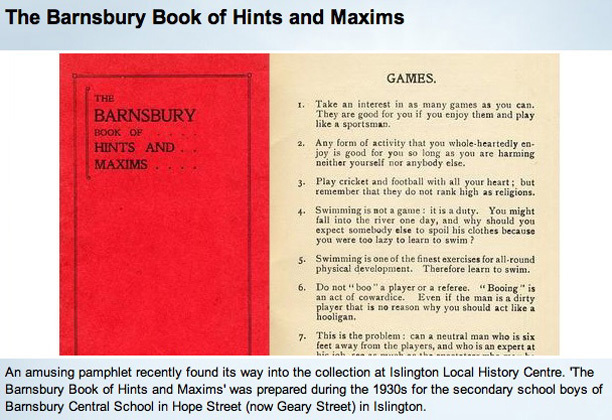 Electronic copies of the Barnsbury Book of Hints and Maxims, compiled in the 1930s for Barnsbury Central School for Boys, is available on request. Copyright law protects the publication. Anybody holding an electronic copy should retain the document in their private archives only and should not reproduce it elsewhere as a public domain file.